Burnley’s remarkable start to the season on the road continued yesterday as we followed up the Chelsea win and the draw at Spurs with another point in a well earned 1-1 draw against Liverpool at Anfield. A year ago today we were losing 3-0 at Leicester, a second successive 3-0 defeat on the road to start the 2016/17 season. The next game was no better, in fact in terms of performance it was a lot worse, as we went down 3-1 at Southampton. That set a pattern for an oft discussed poor season on the road that actually started to pick up just before Christmas when we were at least staying in games and finding ourselves unfortunate not to pick up some points. There is no guarantee that this is going to be a good season away from home but, at the very least, we have made a decent start and this point, which was won despite some late Liverpool pressure, has taken the total to five already, just two behind last season’s final total. With some Premier League clubs, well one in Crystal Palace, in crisis, they were already a goal behind in their latest game at Southampton when we reached Liverpool for a pre-planned lunch in the city centre close to the Liver Birds, and not the pair created by Carla Lane. Refreshed and replenished, we parked up a short walk away from Anfield with not even a request for a car minding payment. The delay in getting into the Anfield Road end of the ground was too much for some but this is going to be the story now at many grounds, including our own, with extra searches and checking prior to entry. I was at my seat in good time at what is surely the only Premier League ground where all home supporters actually sit. That wasn’t the case with Burnley fans with many standing in one of the poorer of away sections in the league. The team news came through showing one change for the Clarets with Scott Arfield returning at the expense of Sam Vokes as Sean Dyche returned to the system that had served us so well in the previous two away games. There was no sign of Jeff Hendrick. The club confirmed he was fit and back in contention on Thursday, information which was later repeated, but he didn’t make the bench which was the same as in the Palace game other than the Arfield/Vokes swap and Adam Legzdins coming in as the substitute goalkeeper. Unlike last season, we played towards the Burnley supporters in the first half but we didn’t quite make the sort of start we did last season when we got on top of Liverpool in the opening exchanges. They might have been without Sadio Mané but there was plenty of attacking threat with Roberto Firmino, Mohamed Salah and the returning Philippe Coutinho and they gave us plenty to think about as they looked to get an early lead in the game. That they didn’t was all credit to us. We defended brilliantly, and not just the back four either. We kept them at distance, rarely allowing them into our penalty box, and when they did our two central defenders, James Tarkowski and Ben Mee, were like rocks. It’s almost unfair to single them out. Jack Cork and Steven Defour were equally outstanding in front of them, as were the two wide men, while up front Arfield was covering some ground trying to get up alongside Chris Wood who was winning everything when the opportunity arose. I haven’t mentioned Pope. At this stage his contribution was minimal because of the work being done in front of him and I’m not sure he’d really been called upon when we had the audacity to provide a repeat of last season and take the lead. Robbie Brady saw a cross blocked but won it back with a header with Defour, as he was throughout the game, making himself available. He played it to Stephen Ward and then the Belgian stepped back to work the ball with the two central defenders before Tarkowski played the ball out wide to the left. This time Brady won his header against Trent Alexander-Arnold. It looped up towards Wood who got a slight touch on the ball for the incoming Arfield. I don’t think I had a better seat in the house to see us score, situated right behind Simon Mignolet’s goal and long before Scott’s calm shot into the corner crossed the line the celebrations had started. What a shame we couldn’t keep the lead, but within three minutes it had gone. Emre Can, who scored the winner against us there last season, played a delightful ball forward for Salah who got the better of Ward to fire home, and at that point another long and difficult afternoon looked once more to be in prospect. I don’t think we offered too much to be honest before Roger East, probably the poorest referee we’ve had all season, blew for half time but we were able to go in level. I have to say that for most of the second half it was the home side dominating possession. They put us under pressure but we defended brilliantly when needed and limited them, certainly in terms of goal attempts, to a very small number. Pope made a couple of routine stops and then a very good save. He was even ridiculously yellow carded by East for time wasting. I think everyone in the ground knew East had been conned and that the decision had been given by the home fans. Soon after, Mignolet spent far longer in releasing the ball without a solitary word from the referee. Embed from Getty ImagesThe best was still to come from our goalkeeper but not until our stand in captain Mee had twice come close to winning it for us with headers from corners. His first was cleared off the line by Joel Matip with Mignolet saving his next. Mee had his shirt pulled on the first one. Penalty? Maybe, but they could have had one soon after when Mee caught Salah. I didn’t think so at the time but we could have had no complaints. But they still got the ball into the middle for substitute Dominic Solanke who failed to score because of a combination of an incredible save from Pope and the bar. After that they huffed and puffed but I can’t recall one more occasion when I thought our goal came under threat. Still, it was a relief when that final whistle blew on yet another incredible and wonderful away result. This season we’ve already picked up our first win at Chelsea since 1971, our first point at Tottenham since October 1974 and yesterday was the first time we’ve brought a point home from Anfield since September 1974. Those two games in 1974 were successive away games and both ended in wins. When the fixtures were released and I saw the first five away games I thought if we had one point from them then we’d be in credit. I’m still checking the table to confirm that we’ve already got the five. Sometimes it is all about great goals, and ours was a good one yesterday, but sometimes getting points is about defending well. Phil Neville, on Match of the Day, described our performance as unbelievable with brilliant defending. He even said we enjoy defending. It was pure joy in the away end at the final whistle after another fantastic away day for the Clarets that keeps us seventh in the league. It’s been an incredible start to the season. That left us with just enough time to visit a quality restaurant on the way home. It was the one with the golden arches, but it was only for a celebratory McFlurry. It’s a couple of home games this week and then back to Merseyside in two weeks time on the other side of the park. I’m looking forward to it. 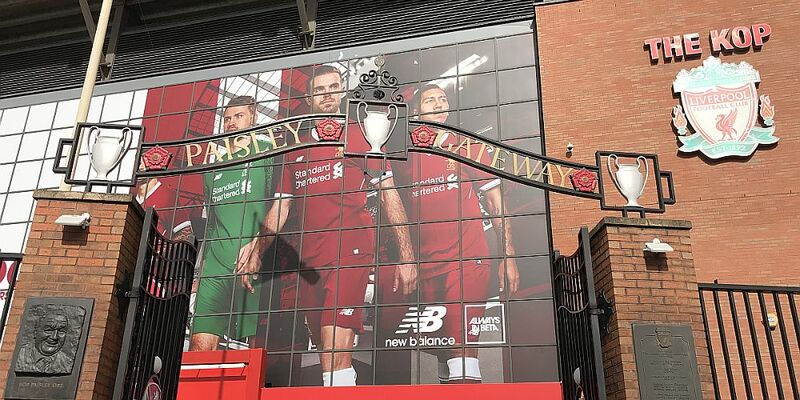 Liverpool: Simon Mignolet, Trent Alexander-Arnold, Joel Matip, Ragnar Klavan, Andrew Robertson, James Milner, Emre Can, Philippe Coutinho (Dominic Solanke 78), Mohamed Salah, Daniel Sturridge, Roberto Firmino (Alex Oxlade-Chamberlain 79). Subs not used: Loris Karius, Dejan Lovren, Alberto Moreno, Jordan Henderson, Georginio Wijnaldum. Burnley: Nick Pope, Matt Lowton, James Tarkowski, Ben Mee, Stephen Ward, Johann Berg Gudmundsson (Ashley Barnes 60), Steven Defour (Ashley Westwood 87), Jack Cork, Robbie Brady, Scott Arfield, Chris Wood (Sam Vokes 87). Subs not used: Adam Legzdins, Phil Bardsley, Kevin Long, Jon Walters. Yellow Cards: Nick Pope, Jack Cork.